How do you delete a file completely and forever? I thought the original still remains on the hard drive until it is overwritten. And is there a way to go back and permanently erase old previously deleted files? We’ll start with the basics. When you toss a file into the Trash and then empty it, the file isn’t really gone. It’s simply removed from your Mac’s file directory. With the proper recovery tools (Prosoft Engineering’s $99 Data Rescue 3, for example) you can recover it provided that you haven’t added other files to your Mac that have overwritten the portion of the drive that file once occupied. To delete a file so that it’s unrecoverable by all but those who make their living recovering data, toss the file into the Trash and instead choose Finder -> Secure Empty Trash. When you do this not only is the file removed from the Mac’s directory, but the hard drive space it occupied is overwritten with junk. While you can’t go back and target specific deleted files for “no really, I want you totally gone” erasure, you can erase the “free” space on your Mac’s hard drive. This seeks out any areas of the drive marked as available for new data and overwrites them with junk. To do this, launch Disk Utility (/Applications/Utilities), select the drive that you want to work with, click the Erase tab, and click on Erase Free Space. A sheet will appear that offers you different levels of erasure. 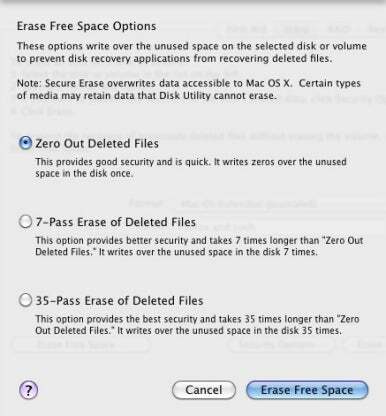 With Snow Leopard this sheet offers Zero Out Deleted Files, 7-Pass Erase of Deleted Files, and 35-Pass Erase of Deleted Files. Under Lion you see a slider that offers essentially the same options. The default, Zero Out Deleted Files, writes zeros over the drive’s free space. It’s adequate for most people (though you’ll want to keep an eye on this story’s comments as some people have nearly religious views on this matter). If you’re an International Man/Woman of Mystery, you can choose one of the other options with the understanding that while they more thoroughly overwrite your data, they take a very long time to do so. I would be remiss if I didn’t caution you to have a solid backup of your data before doing this. I’ve never had a problem with it, but should an unlikely problem occur, you don’t want to be left staring dumbly at a file-free hard drive.